2 Corinthians 4:15-18 (ESV) – 15 For it is all for your sake, so that as grace extends to more and more people it may increase thanksgiving, to the glory of God. 16 So we do not lose heart. Though our outer self is wasting away, our inner self is being renewed day by day. 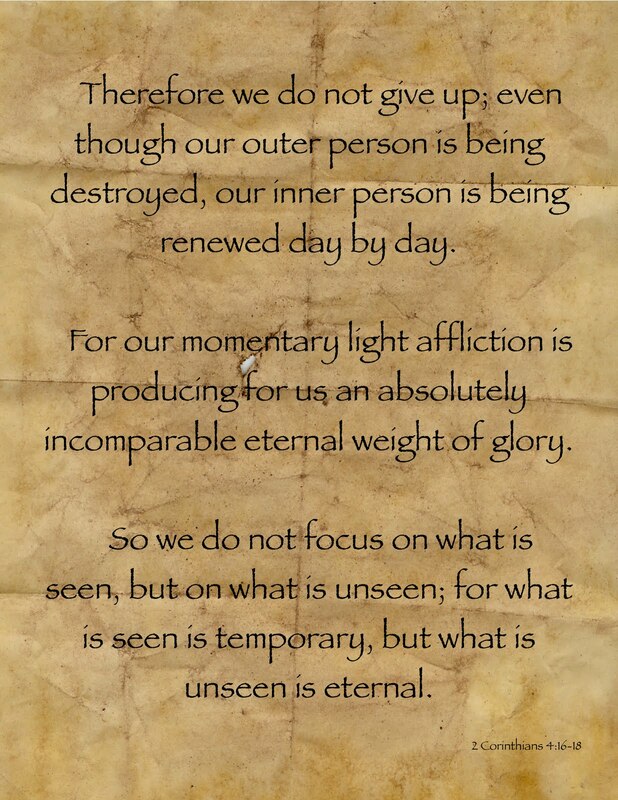 17 For this light momentary affliction is preparing for us an eternal weight of glory beyond all comparison, 18 as we look not to the things that are seen but to the things that are unseen. For the things that are seen are transient, but the things that are unseen are eternal. As Paul went about preaching and teaching the Good News of the gospel, he was verbally abused, physically persecuted, beaten and even left for dead. Yet his spirit remained strong and continued to increase. Paul knew that the things of this world are “transient” and would soon pass away. But his spirit was increasing and would be everlasting. Thus his focus was ALWAYS on things eternal and on leading more souls to God through Christ Jesus “so that as grace extends to more and more people it may increase thanksgiving, to the glory of God.” Now that is purpose! Heavenly Father, we give You Thanksgiving Praise for providing us eternal hope! Thank You for the assurance that all things earthly are transient but all things heavenly are eternal! Help us to not focus on the trials and tribulations of this world but instead experience the joy of knowing that we will spend an eternity with You! Father, strengthen us as we point others to Jesus so they, too, may not lose heart. In the powerful and loving name of Jesus, Amen and Amen! Jim Davenport resides in the USA in Northeast Georgia, is a member of a Southern Baptist Church and is a retired Christian business man. Jim and his wife Charlotte have one son and daughter in law, Keven and Amy, four grandchildren – Ashlyn (Davenport) & Josh Murphy, Mason & Rebecca (Knight) Davenport and four great-grandchildren. Jim and Charlotte own a mountain get-away home located on Lookout Mountain in Alabama where they spend many spring, summer and fall days working in their raised bed organic garden. Jim has served as a Deacon and Trustee in his local church most of his adult life and on the Executive Committee and Finance Committee of the Board of Trustees of Shorter University, an intentionally Christian institution located in Rome, Georgia. Jim has a passion for the word of God and has always believed that Christian principles should guide every aspect of his life. He also loves Christian music and often served as a tenor soloist in his church. One of the highlights of his life was the nearly 20 years he spent singing with The Good News, a Southern Gospel quartet. Jim served as an Information Technology professional his entire working career of 50 years holding senior positions in and consulting with hundreds of world-class organizations in the United States, Canada, Europe, Central and South America, Australia and New Zealand. Jim remains as President and CEO of InfoSys Solutions Associates, Inc. and is a retired partner of IT Governance Partners, LLC, both of which are “Trusted Advisor” technology and business consulting firms. 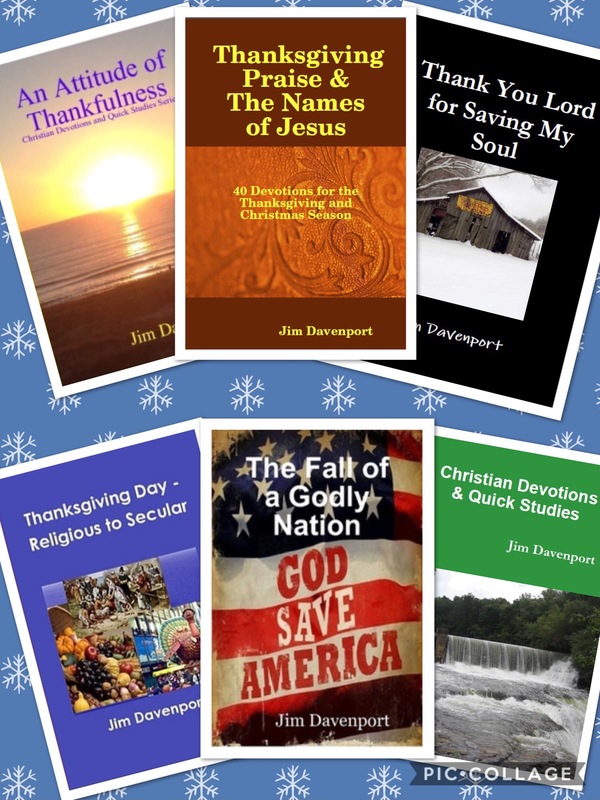 Jim has authored a number of books available at www.jimdavenport.me/jims-books. His blog has ben read by readers from more than 170 countries. Jim holds both a BS and an MS in Mathematics from Georgia State University in Atlanta, Georgia and completed Management Development Training at Emory University in Atlanta, Georgia. Gallery | This entry was posted in Bible Studies, Christian Devotions, Uncategorized and tagged 2 Corinthians 4:15-18, adversity, Almighty God, bible studies, Christ, christian devotions, creator, devotions, God, God cares, God knows, God provides, health problems, helmet of salvation, Jesus, Lord, Maker, Psalm 28:7, Psalm 95, shield of strength, strength and shield, thanksgiving, thanksgiving devotion, thanksgiving praise, Thanksgiving Prayer, things seen, things unseen. Bookmark the permalink. Thank you, Jim, for the wonderful good news! No matter what we are going through, the Lord is our strength and the ONLY ONE who can give us true peace! It was so good to see you at our Trustee’s meeting a few weeks ago! You were always such a delight and I will really miss you! I pray that your health continues to soar and that you will continue to give the Lord praise for what He is doing. Our love to you and your sweet family! Hi Marilyn, thank you for your encouraging words. I will miss serving as a Trustee at Shorter. The university is in great hands and has a bright future. Here’s wishing you and your family a happy Thanksgiving! We have so much for which we should be thankful … Praise Him! Great article Jim … I have been wrestling a bit this week with the issue of pain … as we discussed over breakfast this morning. I’ve come to a couple of conclusions this week that seem somewhat aligned with what you have written here. When we are forced to engage pain and/or suffering in this life, the response of the natural man is to seek relief from that pain … the flesh demands it. Perhaps we do that with medicine … or perhaps we depend on doctors to rectify whatever is causing the pain. At any point, some time our obsession with escaping the pain, especially when our strategy is thwarted, does indeed result in a loss of hope … and we do lose heart. And yet I so strongly believe (and on the other had so frequently forget), that God is found in the midst of that pain … in fact I some time wonder if pain and suffering isn’t the proverbial knocking on the door we read of in Revelation. The spiritual man then becomes at odds with the natural man … not obsessed with seeking relief but instead obsessed with seeking the Redeemer. I can truly say that my most intimate and precious moments with the Lord occur in the midst of pain and suffering. Sadly His status with me moves from ‘intimacy’ to ‘acquaintance’ in the good times … forgive me Lord! So the words of the Lord revealed and written through Paul ‘We do not lose heart’ are spot on … no doubt the Lord blessed Paul with great wisdom in the midst of his trials and tribulations. Thanks for this timely post brother … you are indeed a blessing to me! Bernie, I am so pleased that my post was timely for you! The Lord is working behind the scenes to help us encourage each other. Our meeting today was such a great encouragement to me. You are such a blessing to me my brother. Blessings, Jim D.